Home Yu-Gi-Oh! Yu-Gi-Oh! News Yu-Gi-Oh! 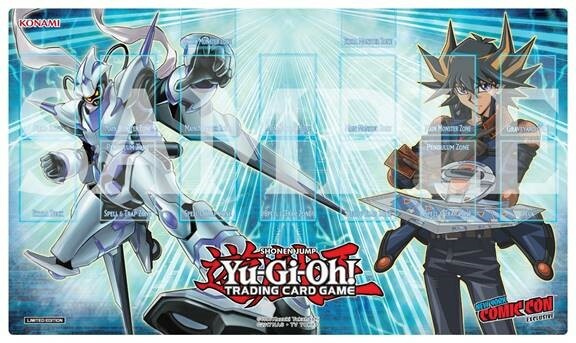 TCG at NY Comic Con – Exclusive Playmat & more! Yu-Gi-Oh! TCG at NY Comic Con – Exclusive Playmat & more! El Segundo, Calif. (October 1, 2018) – Making its return to New York Comic Con, (NYCC) Konami Digital Entertainment, Inc. (KONAMI) delivers plenty of exciting activities for attendees to experience as they head into the exhibit halls of the East Coast’s biggest pop culture convention held this year. The company will showcase the world’s best-selling Yu-Gi-Oh! TRADING CARD GAME (TCG) and plenty of other activities in booth #1321 during the show’s October 4 – 7 run at the Javits Center. With over 70 million downloads to date, the gaming app Yu-Gi-Oh! Duel Links continues to be enjoyed by fans worldwide on iOS and Android devices, as well as PC Steam, and New York Comic Con attendees can experience the brand-new Yu-Gi-Oh! 5D’s update to this exciting game. Choose from a selection of pre-generated Characters to Duel with their signature decks including Yusei, Akiza, Leo & Luna, available for the first time ever, and battle your opponent for a chance to earn a limited-edition lanyard! All participants will get a prize, while supplies last.